A couple of months ago I got asked to review Broken Portraits: Jonathan's Chronicles by Efioanwan Edem. Unfortunately it took me longer than I had hoped to finally read it. I was able to read it last night and I have to say I enjoyed it. Broken Portraits is Nigerian author Efioanwan Edem's debut novel and it tells the story of two twenty-something Nigerian men who win a scholarship to study at Ridge University College, a fictional constituent college of the University of South Africa. Jonathan Ambo, our narrator, is an aspiring writer and his cousin and best friend, Benjamin 'Bengy' Bocco, is an artist. It starts at the end with a letter our narrator writes to Ibiwarri, Bengy's fiance in Nigeria. It seems Bengy has got himself into a spot of trouble while in South Africa and he has asked Jonathan to write a letter to Ibiwarri, telling her the entire sordid details of their time in South Africa. Once the letter finishes, Jonathan begins his tale. It starts in Nigeria on the campus of the College of Basic Studies. Women love Bengy, who is the player-type, until he meets Ibiwarri. Jonathan is the loner type and was really just at the College of Basic Studies 'just to pass time and get [his] A-level Certificate while at it'. Ibiwarri worries for Jonathan - 'your books, characters are no substitute for real people; a real, flesh and blood woman'. On a rainy day, Jonathan finds a poster for the African Universities and Colleges Exchange Programme and he and Bengy both apply (to Ibiwarri's dismay). After both winning the prestigious scholarship to Ridge University College, Jonathan and Bengy hope this would be what they need to see the world. In South Africa, they meet Professor Constance Tobe, the Dean of the College and Co-ordinator of the Scholarship Exchange Programme; his wife, Doctor Florence Consatnce Tobe, the head of the English and Literary Studies Department; Aretha Dominic , a Theatre and Performing Arts two hundred level student; and Martha Cliffe, a final year student at the Africa Centre for Arts and Cultural Heritage, who has very passionate views on the current state of South Africa, and the so-called 'freedom of the city'. While in South Africa, romance blossoms - an unexpected one between Jonathan and Dr. Florence Constance Tobe and an unfortunate one between Bengy and Aretha. As the novel is set in South Africa in 2008, there are also elements of xenophobia, with some focus on the xenophobic attacks that occured in South Africa in May 2008. I have to say I didn't know what to expect when I first started reading Broken Portraits, but with time I grew to like it. Jonathan grew on me. I initially thought he used way too much 'big grammar' but then with time I realised he would be the type of man to speak (or should I say write) the way he did. He was after all an aspiring writer who loved Shakespeare and Tennessee Williams. Jonathan was a really smart man, but I wasn't sure how I felt about him saying when he went to Marabastad 'the Indian merchants looked so brown and so identical to me, and smelt too strongly of the sweet paste, which they used in their hair'. I also initially thought the story would be about both Jonathan and Bengy, but since it was told purely from Jonathan's point of view, Bengy only really featured in the story when he was with Jonathan, or when Jonathan was talking about him. 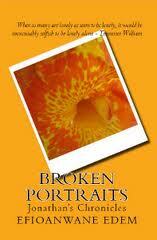 Broken Portraits: Jonathan's Chronicles was an interesting debut novel and a pretty quick read. I am glad I had the opportunity to read it.